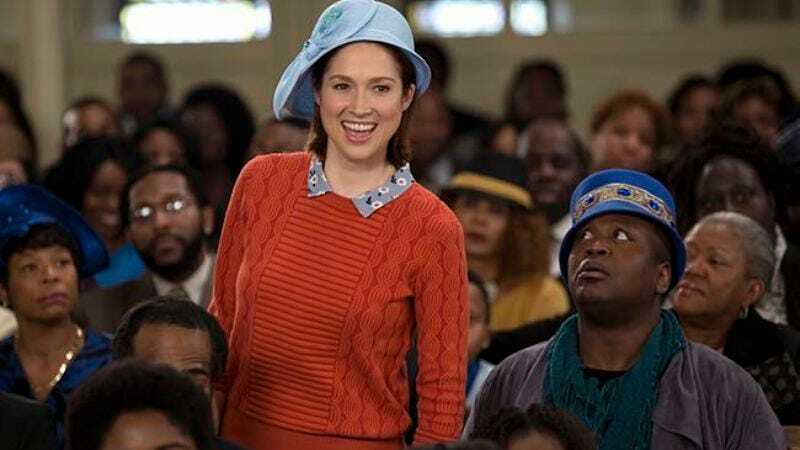 For all its darkness, Unbreakable Kimmy Schmidt has a huge heart, and it finds warmth and depth in surprising places. In “Kimmy Goes To Church!,” Kimmy asks Titus to take her to church as part of her mission to accept that not all reverends are bad. There, she meets Ms. Clara, who Titus warns Kimmy about immediately. According to him, she’s a snake in the grass, a gossipy church lady who excuses her shady behaviors by quoting the Bible. Kimmy sees Ms. Clara’s busybody behaviors and concludes religion is all founded on manipulating others, but in a final twist, Ms. Clara proves to neither be bad nor good. She’s flawed, just like the rest of them. Unbreakable Kimmy Schmidt has a clear villain: the reverend, but outside of him, the show isn’t prescriptive of its other characters’ moral failures. Titus has been reconciling with the fact that he’s selfish all season, and in “Kimmy Goes To Church!,” he performs a small, yet significant for him, act of self-sacrifice by joining the church choir, led by a tone deaf director whose off-key singing nearly makes Titus catatonic. Ms. Clara, as it turns out, is definitely a gossipy busybody, but she has her redeeming qualities, too, and she’s aware of her imperfection. She hopes her gay nephew will find love, and she cares about people in the congregation, even if she has a harsh way of showing it. Kimmy’s initial views of church are shattered when she becomes convinced Ms. Clara is a bad person. But then her mindset is shattered once again when Ms. Clara acknowledges her faults and says she’s working on them. Real religion is about knowing we’re not perfect but striving to be better, Kimmy concludes. In fact, Titus and her come off as looking like the bad people for making unfair assumptions about Ms. Clara. And Unbreakable Kimmy Schmidt isn’t too precious about this realization. The show’s ability to take traditional sitcom storylines and tropes, spin them into zany proportions, and then still lead to organic emotional moments for the characters consistently impresses. The same thing happens on a smaller scale in Lillian and Jacqueline’s storyline. I’m always amused by the creative yet cogent ways the writers get these characters to interact. Jacqueline and Lillian have nothing in common, but they’re thrown together once again when Lillian has nothing to wear to a Seder supper with Artie and his family, and if there’s one thing Jacqueline knows, it’s how to impress rich men. She gives Lillian an absurd makeover in the style of a movie makeover montage, and both Jane Krakowski and Carol Kane sell the hell out of it. Then things take an unexpected turn: Jacqueline lets Lillian give her a makeover that turns her into a droopy ol’ stoop crone. It was always clear that Lillian would realize that her new look wasn’t for her, but the story goes one step further by connecting it to Jacqueline’s arc this season. She dresses down with Lillian and then remembers at the last minute that she has to pick up her son Buckley at an event full of all the people she’s always trying to impress, including none other than Deirdre Robespierre (Anna Camp, with a fantastic but too-short return). It brings Jacqueline back to the time she showed up to a date at the ballet dressed in fishing gear because she thought Swan Lake was an actual lake. But this time when Jacqueline shows up, she realizes she doesn’t care what they all think about her. She doesn’t care what anyone thinks about how she looks anymore. Her storyline here is connected to her larger journey to transcend her trophy wife label. Interestingly, when she confesses to the club folks that she’s from South Dakota and was born in a hospital that’s technically in a Sears, she doesn’t also bring up her Native American background. The writers are so pick-and-choosy about when to use this part of her background and when to ignore it, which is especially frustrating because the show has gone to drastic lengths to try and excuse the decision to make Jacqueline Native American. It feels a little like they’re trying to have it both ways by repeatedly attempting to justify the decision while also distancing themselves from it. This speech seemed like a clear opportunity for her to bring it up, and “I’m from South Dakota” is weirdly euphemistic here. Life According To Titus: Religion is just manipulation…and cut-up donuts, which he can easily put back together again. “Everyone, don’t look! Jacqueline’s having a breakdown!” Camp’s giddy delivery of this encompasses everything I love about her performance on this show. Does anyone else feel like Titus is the star of this season?